That one sure looks like an anomaly; maybe it's not related to heartbleed. I chatted with GlobalSign tech support via their online chat. The person I talked to told me that this is real and due to heartbleed. Quoting Kaldek: That one sure looks like an anomaly; maybe it's not related to heartbleed. While I think each bullet you posted does refer to a large portion of people, right now we have no reason to believe that this isn't accurate data. The best guesses we have seen are in the range of 800,000 Heartbleed vulnerable sites. It's possible that the bullets you point to are still the majority and that this spike is only the minority. Don't get me wrong - I was hoping it was accurate data! It seems from Dr J (whom I assume is Johannes) that it's been proven now. In a year's time the lessons learned are going to make for great material in GSEC. That's about the only silver lining I can think of. Is the slow ramp-up of revocations simply an indicator of the increase in issuance/usage of certificates over the last 6-7 years? If we assume 3-4 year lifespans, then the beginning of the ramp-up in 2011 corresponds to certificates issued in 2006-2008. I know DoD was smack in the middle of their huge PKI push in those years (as I was the stuckee for PKI implementation at my unit), so it's not out of the realm of possibility that the gradual increase in revocations starting in 2011 reflects our growing reliance on certificates. Once a certificate expired, there is no need for it to be listed in the CRL anymore. So yes, we should see only few certificates older then 2 years or so. There is also likely a delay in having a certificate added after it is revoked to give the organization enough time to swap certificates. As far as Globalsign goes, I think we see a big hit from them because they are working with Cloudflare. If you "proxy" an SSL site via Cloudflare, Cloudflare is going to request a certificate for it. So as Cloudflare became aware of Heartbleed (and they were ahead of the game on it), the likely issued all new certificates which in itself could explain the 100k or such revocations that came through yesterday. Doesn't the mid-2011 spike match the DigiNotar event? 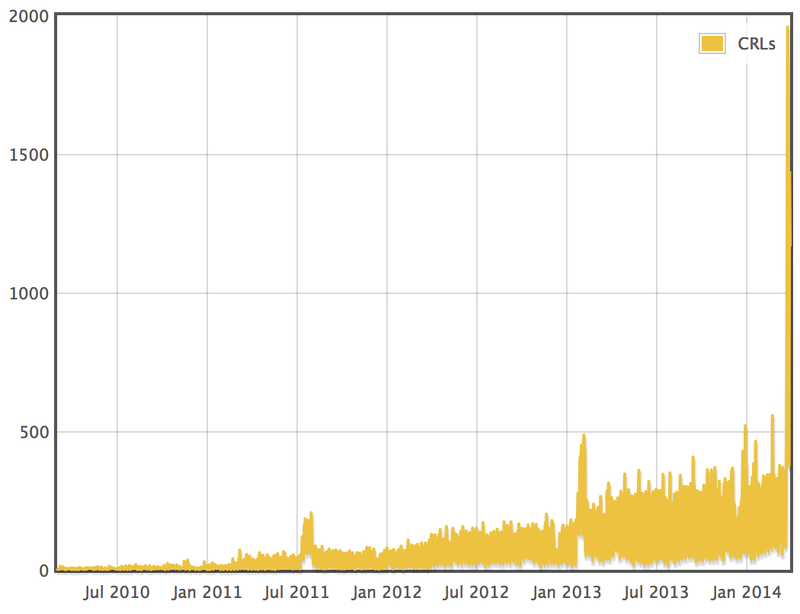 Perhaps the early 2013 spike is some large organization rolling their certificates in response to Heartbleed? The 2011 CRL tsunami is probably attributed to the DigiNotar compromise. Just my surmise on both counts. I thought the same about DigiNotar being responsible for the 2011 spike, however that spike appears to have happened on July 28th specifically in our data, about a month early. I'm not sure exactly what this means, just pointing it out. 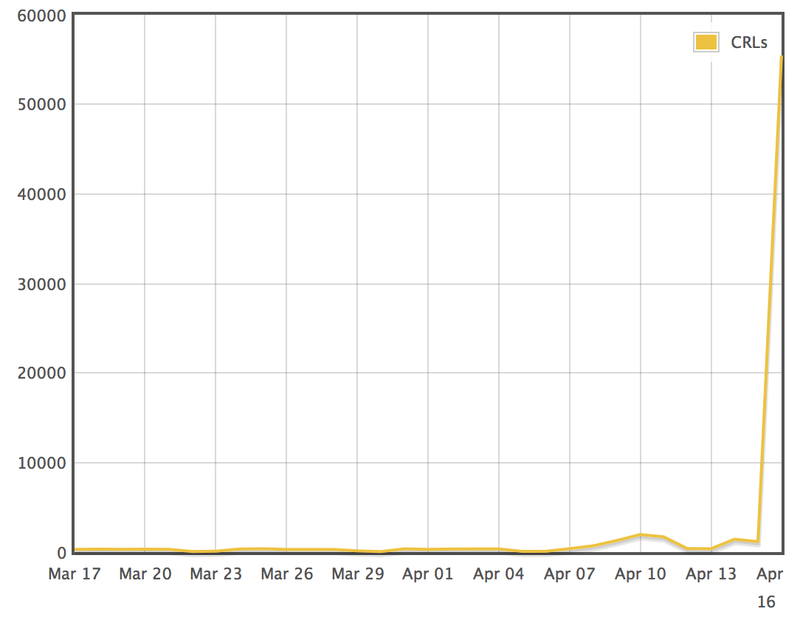 It appears to have been an influx of about ~750 revocations (seems tiny compared to the recent spike!) so many different organizations easily could have been solely responsible. Thanks for all of the comments everyone, it's great to see more new names in the forums!